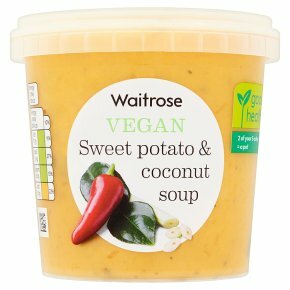 INGREDIENTS: water, sweet potatoes (16%), butternut squash (12%), onion, tomatoes, coconut cream (5%) (coconut extract, water), red pepper, potato, chickpeas, ginger purée, garlic purée, lime juice, rapeseed oil, coriander, salt, lemon grass, dried carrot, dried onion, red chilli, lime leaf, tomato powder, sugar, dried leek, garlic powder, dried parsley, sunflower oil, white pepper. Time: 6-7 mins. Gentle Heat. Empty contents into saucepan. Heat gently over a medium heat, stirring occasionally, until piping hot. Stir before serving.